Explore eight islands with their volcanic vistas, giant tortoises, marine iguanas and bird colonies. Snorkel with turtles, rays and perhaps even sharks. 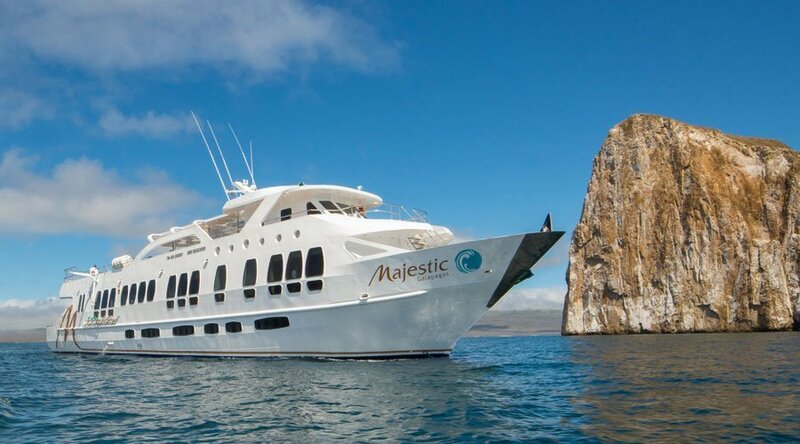 Seven-nights Galapagos Cruise aboard the luxury-class yacht Majestic Explorer. Flights can be arranged by the operator from anywhere in the world. 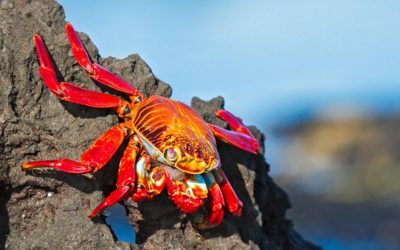 The Galapagos Cruise itinerary is tailored to give you the most out of your once-in-a-lifetime adventure. The pace of the tour takes into account the needs of photographers and natural history enthusiasts. We strive to provide you with more extended island visits than most operators and land on shore earlier in the day for best photographic opportunities. 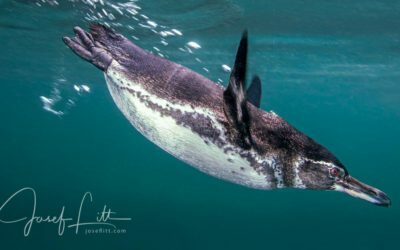 The Galapagos Cruise days usually start early with a morning excursion to a visitor site to be back on the boat before it gets too hot on land. The time before lunch can be spent snorkelling. Depending on the location, lunch is followed by a zodiac cruise or, again, snorkelling. Afternoon excursion to land will end by 6 pm when the National Park closes. The expedition leader will give an evening talk before or just after dinner, followed by the Naturalist Guide’s briefing for the next day. 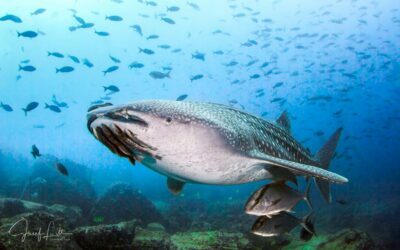 Galapagos Cruise trips belong to the more active holidays. The trails on land are about a mile to a mile and a half in length ranging from a “walk on the beach” to traversing uneven lava rock or climbing stairs to a viewing platform 144 m above sea level. Crew members are always there to assist with stepping off the yacht down into the inflatable boat and from the boat to a lava dock or on the beach for wet landing. You should be in good physical condition to enjoy the Galapagos Cruise to the fullest. However, anyone is free to opt-out from a part of the programme be it a landing, snorkelling or an evening talk, and to enjoy some quiet time. 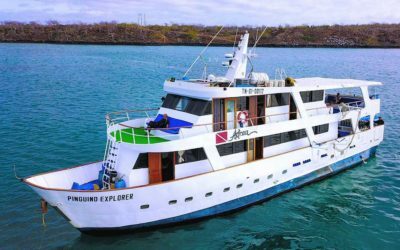 Launching in August 2018, Majestic Explorer builds on the Explorer Ventures Fleet and all their years operating in the Galapagos. 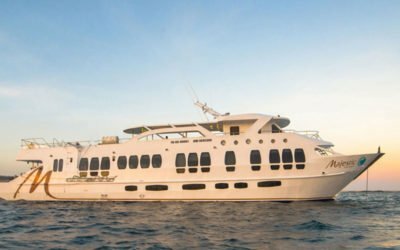 We welcome this modern, elegant liveaboard to one of the top nature and diving destinations in the world. Stop day-dreaming – it is time to make your Galapagos Cruise dreams come true. Majestic Explorer is a spacious 36 m liveaboard, sleeping only 16 people across two decks. There are eight air-conditioned rooms located on the main and lower decks, all with en-suite bathrooms, soap and shampoo. No matter which cabin you have, you will love the ocean view windows, letting the light flood into your cabin. Six of the eight cabins have twin beds, and all cabins can be converted to queen beds for couples. Please do let your Galapagos Cruise travel consultant know your preference at the time of booking. The communal areas have been thoughtfully designed. She features a partially covered sun deck with a jacuzzi and ample seating, salon area with dining, bar and entertainment area. The all important dive and snorkelling deck is generous and features a bathroom, large camera table with charging station, individual storage areas, rinse bins for cameras and another for gear. All landings and dives are made from the two large pangas (tenders), which are easily boarded from the dive deck. Thank you for your kind message. I sent a reply to your email. I look forward to welcoming you and your partner aboard Majestic Explorer!